Both United Airlines (IATA Airline Code – UA) and Delta Air Lines (DL) (through the acquisition from Northwest Airlines (NW)) have secondary hubs in Narita International Airport (IATA Airport Code – NRT) in Tokyo, Japan. UA operates an additional one at Guam International Airport (GUM). Less than 10 years ago, it was common to see United and Delta operating many larger aircrafts like the 747-400 from Tokyo to other Asian cities so that they would be utilized more efficiently. However, is current operating conditions favorable to continue this practice? We will explore Tokyo as a hub in the following insight with focus on how United and Delta manage its operations. 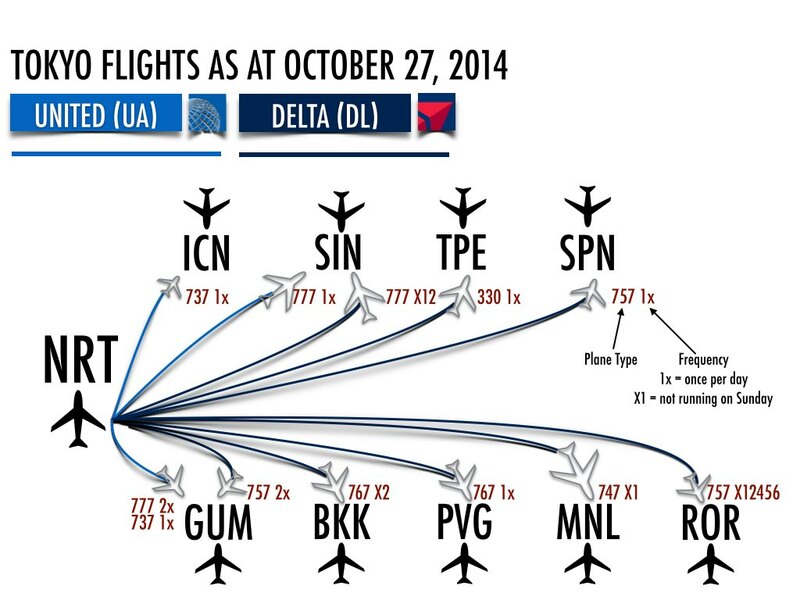 Current flight network for Delta (DL) and United (UA) in Tokyo (as at October 27, 2014) based on information from their respective schedules published online. 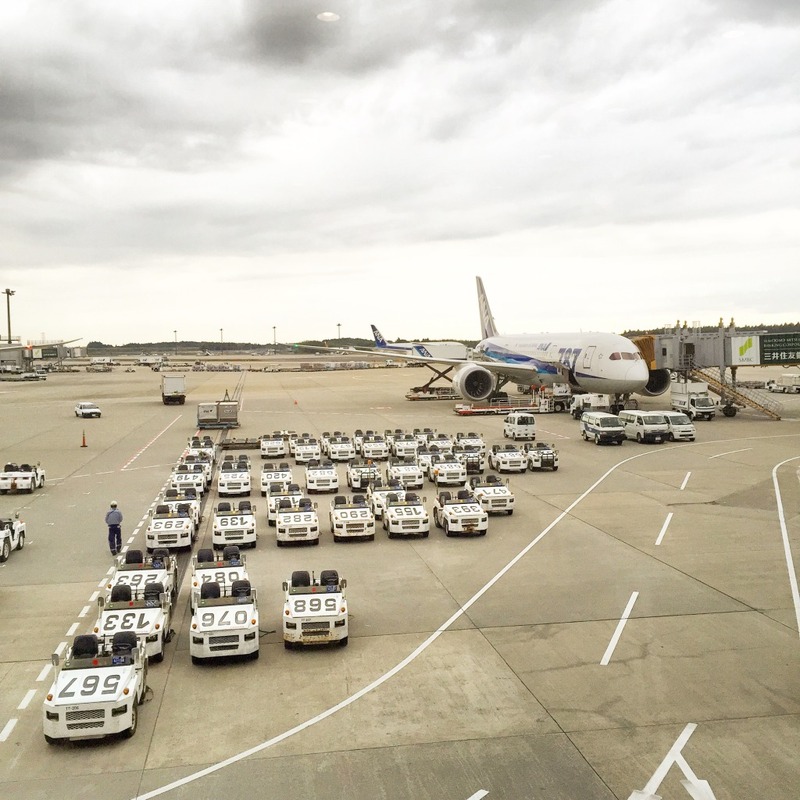 UA has pared down its Tokyo operations significantly for the past 5 years. It stopped flying to Hong Kong (HKG), Taipei (TPE) and Bangkok (BKK). In addition, it down-gauged Seoul (ICN) from a 777 to a 737 to meet the actual demand. Overall, it is only operating 35 flights a week from NRT which is only a fraction of what it was when it operated multiple 747s and 777s. Delta stopped flying to HKG as of October 24, 2014 but still has a significant presence in NRT serving 8 cities with up to 61 flights a week. It is very easy to see why both DL and UA dropped the HKG flights. There is significant competition from Asian airlines operating on this route. On a typical day shown below, there are upwards to 14 flights a day going between these two cities with flights operating from both NRT and Haneda International Airport (HND). The market leader on this route is Cathay Pacific Airways (CX) with 6 flights a day followed by All Nippon Airways (NH) with 3 and Japan Airlines (JL) with 2 flights each. 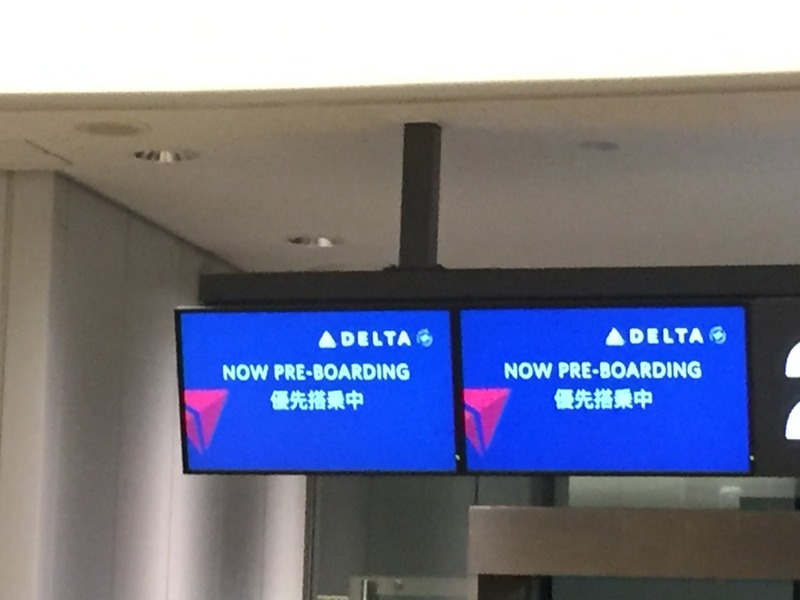 Experience The Skies team members recently flew NRT to HKG on Delta in September and October and noted that the load factor was low in both roundtrips. This is the same situation for larger Asian cities like Singapore (SIN) (where Singapore Airlines (SQ) is dominant), Bangkok (BKK) (where Thai Airways (TG) is the leader) and Seoul (ICN)(where both Korean Airlines (KE) and Asiana Airlines (OZ) are the leaders). While United has reduced costs from operating in Tokyo by closing its flight attendant base, it is a different story with Delta. 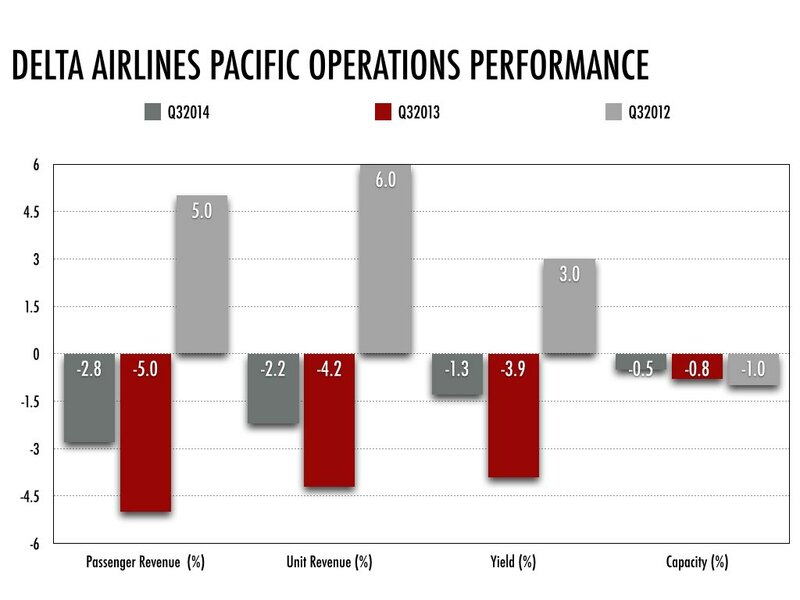 We reviewed the last three years Q3 financial results and noted that the Pacific operations consistently have under-performed from all other operations. As the chart below illustrates, revenue has gone down roughly 10% between 2012 to 2014. Over the past three years, year to year growth in passenger revenue, unit revenue and yield have not been strong. The following chart illustrates that recent capacity reduction has not improved yield (-0.5% vs -1.3%). In addition, passenger and unit revenue were falling faster and more significantly in 2013/2014 compared to 2012. UA stopped using Tokyo Narita International Airport as a hub to feed onwards traffic to other Asian cities in favor of flying non-stop to various locations from the US using newer planes like the Boeing 787-8 which has better economics to serve cities without requiring more passengers to be profitable (e.g. Denver to Tokyo). This change in strategy enabled UA to streamline its Tokyo operations and close flight attendant bases in Bangkok and Singapore. 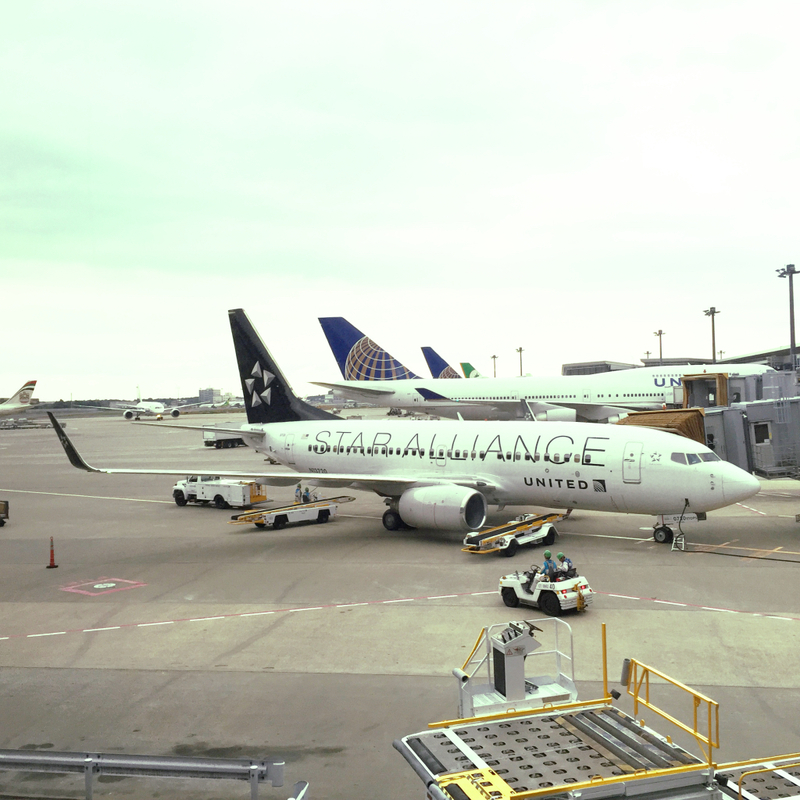 The loss of destinations served directly by UA previously is covered through its joint venture with Star Alliance partner ANA through code sharing. Delta Air Lines serves 8 different cities using different Boeing and Airbus aircrafts. Given the number of flights flown, it has to maintain a bigger operation for flight attendants and maintenance which increase unit costs. In addition, without the economy of scale from flying multiple frequencies, it is hard for DL to compete with Asian airlines and utilize aircrafts more effectively to avoid high parking charges at NRT. 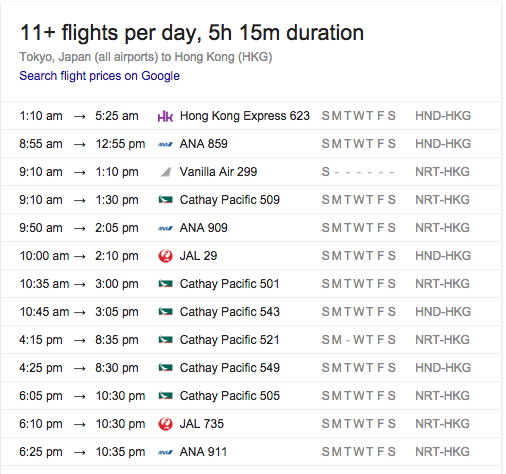 Unlike United, Delta does not have a Japanese SkyTeam partner to cover its Tokyo feeds onwards directly. As reported by Flightglobal.com back in September 2014, Delta has not made a decision on whether it will purchase the Boeing 787-9 or Airbus A350-900 as replacements for the aging Boeing 747-400 and 767-300ERs. As such, it is using more inefficient planes like the Boeing 757 and A330-300 to fly some routes. Both Tokyo airports runs very efficient operations which reduce the layover time for passengers in comparison to flying direct. Although there is competition from other legacy airlines, higher operating costs have deterred low cost carriers from expanding significantly in Tokyo which should maintain the higher ticket prices in comparison to other Asian cities. Both Tokyo airports (Narita and Haneda) have some of the highest landing fees in the world. In addition, personnel and maintenance costs can make operating a hub here a very expensive venture. 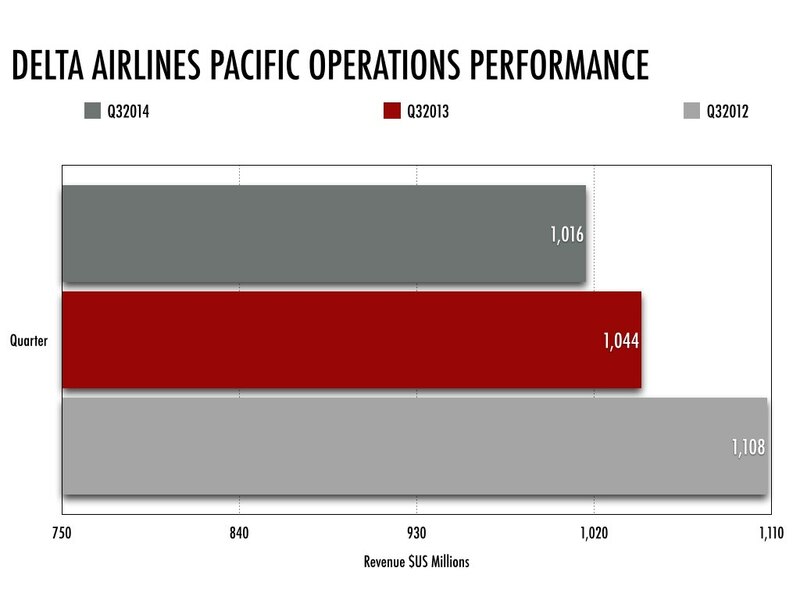 Competition from legacy Asian carriers provide consumers with more choices. United is likely to continue its strategy of flying point to point and leverage ANA in handling most of the feeding passengers from NRT. It may stop flying to Singapore and Seoul especially if yields are not favorable. Once it receives more 787s, it can fly to cities like Singapore directly from the US. If loads and yields continue to deteriorate, Delta may eliminate or reduce the number of flights it operates in Tokyo. Likely candidates for the chopping block include Saipan and Kalau in the short run. In the long term, it will likely use longer range aircrafts like the 787 and A350 to fly more directly to Asian destinations. Please do your research. United never closed their Tokyo/Narita flight attendant base. Would like to know where you got the information. Thanks for the note. The streamline flight operations in Tokyo and Asia in general prompted United to close flight attendant bases in Bangkok and Singapore. We added that to clarify.